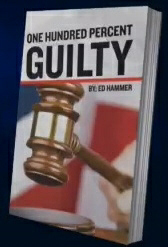 Political corruption is a nationally hot topic these days, and now, in One Hundred Percent Guilty, author Edward Hammer gives a birds-eye view of a scandal that rocked Illinois and changed his life. Written from the perspective of his many years as a cop, Hammer describes how he and his partner Russ Sonneveld were investigating crimes committed by state employees, when they uncovered a pattern of bribes that filtered cash to the campaign war chest of their boss, George Ryan. Even worse, Ryan’s chief of internal investigations attempted to cover-up an inquiry of an unqualified truck driver who caused a fiery crash that burned six children to death and scarred their parents for life. But trying to bring Ryan to justice made both men targets: Sonneveld was fired and Hammer demoted in an attempt to shut them up. When Ryan was eventually elected governor, a handful of tenacious federal authorities began looking into Hammer’s and Sonneveld’s allegations about the crooked governor and his political organization. Finally 13 years after the death of the six children, and 76 convictions later, Ryan began serving his federal prison sentence. Written as tautly as a thriller, One Hundred Percent Guilty is the story of how one corrupt politician had a stranglehold on a state, and how two brave men risked everything to stop him. A page-turner that will keep you glued to your seat, One Hundred Percent Guilty is one hundred percent entertaining. In 1977, Ed Hammer began serving as a police officer with the Illinois Secretary of State Police. Then ten years later he was assigned to be a special agent in charge of rooting out internal corruption in the Office of the Secretary of State. In 1991, he graduated from the FBI National Academy and upon returning to his assignment, Hammer discovered that George Ryan, the new Secretary of State, was corrupt. For the next seven years he clashed with the system for which he worked. Finally, in 1998, the Department of Justice began an investigation that resulted in the indictment of then Governor George Ryan, who was convicted and sentenced. Hammer eventually successfully retired after 27 years as a law enforcement officer. He currently teaches, consults and continues to write.